The flags used during the Texas Revolution represented the diverse beliefs of the settlers of the period. In a few designs, the flag signified the desire for reconciliation with Mexico and a return to government based on the Mexican Constitution of 1824. Most of the flags, however, represented the Texan's desire for total independence from Mexico, and their willingness to fight and die for that cause. One of the best known of the flags of the Revolution is the "Come and Take It" flag used at the Battle of Gonzales. It was later described also as "The Old Cannon Flag" by Noah Smithwick, one of the participants in the skirmish. According to Smithwick, the flag "consisted of a breadth of white cotton cloth about six feet long, in the center of which was painted in black a picture of the old cannon, above it a lone star and beneath it the words, 'Come and Take It.'" 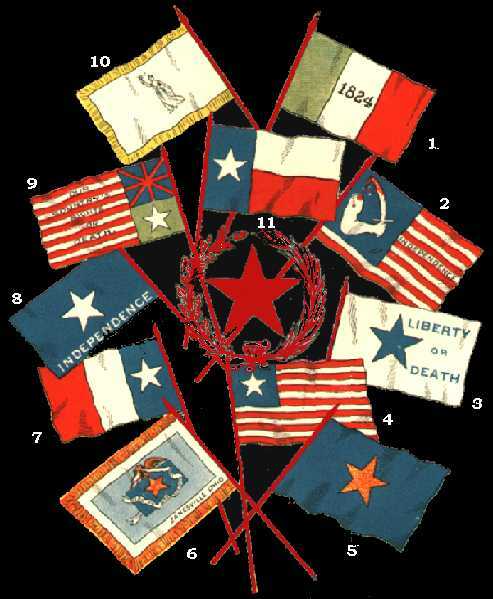 The following are a few of the other flags that were flown in the name of Texas, from the eve of the Revolution through the early days of the Republic. A brief descripton of each is provided below the composite image. Flag of the Alamo--Flag generally believed to be the one flown during the Battle of the Alamo; sometimes referred to as the "1824 flag." Flag of Goliad and Velasco--Unfurled at Goliad and Velasco by Captain William Brown on his return from the Siege of Bexar. Flag of Georgia Battalion--Presented by Joanna Troutman to Colonel William Ward's Georgia Battalion prior to its departure for Texas. Naval Flag--Designed by ad interim president David Burnett and adopted by the First Congress of the Republic of Texas. David G. Burnet Flag (12/10/1836-1/24/1839)--Adopted as the first national flag by the First Congress of the Republic of Texas. Captain Burroughs' Flag--Brought to Texas during the summer of 1836 by a company under Captain Burroughs of Zanesville, Ohio. Dodson Flag--Made by Sarah Dodson, wife of Lieut. A. B. Dodson, for a company he helped organize at Harrisburg in September, 1835. McGahey Flag--First displayed at Lynchburg during the fall of 1835; named after James L. McGahey, who later described the flag. San Felipe Flag--Presented to a company of militia at San Felipe on February 29, 1836; made by two ladies, names currently unknown. Flag of San Jacinto--Used at the Battle of San Jacinto; brought to Texas by Newport Volunteers of Kentucky under Sidney Sherman. Lone Star Flag (official flag after 1/24/1839)--Adopted by the Third Congress of the Republic; became state flag after annexation.